French design that later inspired Victorian stylings give this Victoria mantel its origin. 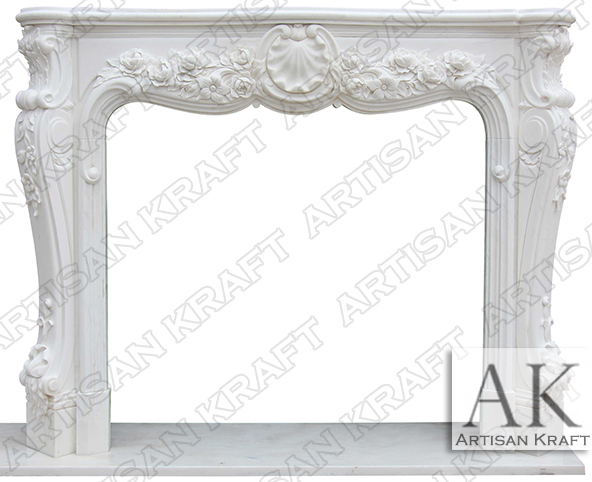 This white marble fireplace is the perfect example of stylings straight from the palaces of France. Fine flower details with “C” scrolls and “S” scrolls carved into white marble. These fine details are even carved on the sides of the leg. The legs of this surround are at an angle. View other surrounds that are part of the Antique Mantel Collection and can be seen on our stock sale page. We have many French Fireplace designs follow the link to view more.